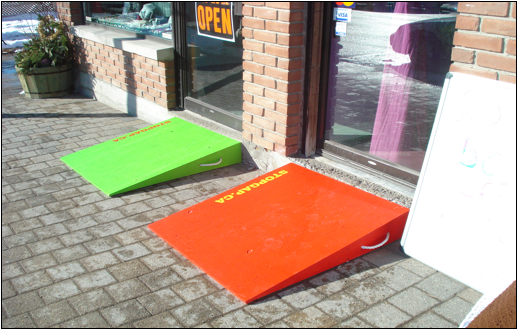 StopGap Guelph ramps are used on an as needed basis due to municipal bylaws. To make it easy to know which businesses have StopGap Guelph ramps, we have provided participating businesses with a sign to place in their front window or on their door. The sign includes their phone number so that anyone wishing to use their ramp can simply call during business hours for it to be deployed. When you arrive at a participating business, just call the number and ask for the ramp to be brought out. Alternately, if you know in advance you will be visiting a business, call and ask for the ramp to be placed out at your arrival time. Although StopGap ramps aren’t a perfect fix to our built environment barriers, this is an exciting and creative way to improve accessibility for all – whether you are a wheelchair user, parent with a stroller or a delivery person.